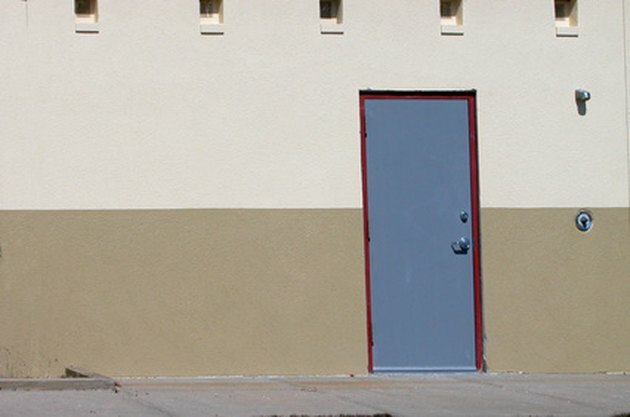 Outside doors should close completely whether or not users provide enough force to ensure that. Other doors, such as public restroom stall doors, are left to be slightly open unless latched. Stanley spring hinges provide tension adjustments to hold doors at any desired angle. A spring hinge has a hex screw in the barrel that controls the adjustment. The hex screw is concealed by a locking screw at the end of the barrel. These specially designed hinges make doors hang open or shut automatically. Choose the angle at which a door hangs with Stanley spring hinges. Remove the locking screw at one end of the barrel with a Phillips screwdriver. Slip a hex key wrench into the open barrel to turn the adjusting hex screw. Use trial and error to find the hex key that fits. Turn the hex key wrench in the direction of the arrow to adjust the door to close more tightly. Leave the door still to check the adjustment. Loosen the spring hinge tension by placing the hex key into the adjustment screw and lightly tapping the end with a hammer. Tapping the adjustment screw moves it into a position that frees the tension spring.